As 2016 draws to a close, I thought I'd offer a quick list of resources for your museum/exhibit/design reading (or holiday gift giving!) list. Each were featured in posts on ExhibiTricks in 2016, so you can click the links in the list below for the full article and/or more information about downloading or purchasing the resources. 1) Exhibition Journal If you are not already a subscriber, you are missing out on the best museum-related journal in the business. Top-notch themes, stories, and design. 2) Sacred and Stolen Gary Vikan's insider account of his time as Director of the Walters Art Museum. His stories give a funny (and scary!) view of the Art Museum world. 3) The SketchUp D'oh Book A great resource for anyone who uses (or wants to start using) SketchUp. 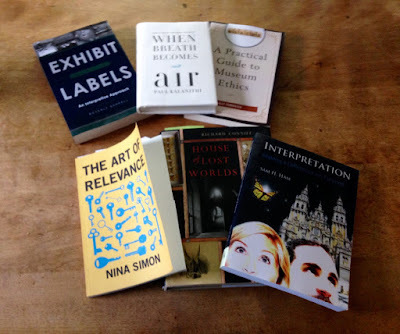 4) The Art of Relevance The latest must-have resource for your professional reference shelf from the indefatigable Nina Simon. 5) Exhibit Labels: An Interpretive Approach The second edition of Beverly Serrell's industry-standard book on creating exhibit labels. 6) Interpretation: Making a Difference on Purpose Author Sam Ham brings practical information to museum workers interested in interpretation, but he also shares what research tells us about how people process information. 7) A Practical Guide to Museum Ethics As the director of the Institute of Museum Ethics at Seton Hall University, Sally Yerkovich brings her expertise to the fore in this interesting and useful book. 8) House of Lost Worlds Richard Conniff puts together an enjoyable history of the Yale Peabody Museum of Natural History. From its unlikely founding 150 years ago, the story is filled with both colorful characters and great moments in science centered around the amazing New Haven institution.